To be honest I really just eyeballed this recipe, added the kitchen sink, and kept tasting until I was satisfied, but I will try to approximate ingredient amounts! Add some protein! 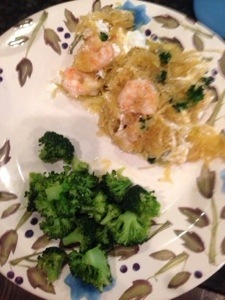 I made this dish with shrimp, and actually sautéed the shrimp in the garlic butter mixture and then poured it over the spaghetti squash and topped with goat cheese. Soo delicious. It feels like a decadent italian meal you should feel guilty about, but you don’t have to! Toss the meat in the arrowroot and black pepper to coat. Cook the chicken in your oil of choice (I used coconut) until no longer pink and then toss in crock pot. Mix coconut amines, rice vinegar, ketchup, sugar of choice, garlic, ginger, and red pepper flakes, then pour the mixture over the chicken in the crock pot. Cook on low 3-4 hours or high 1-2 hours. Add cashews to the mix right before you’re ready to serve and top with green onions. My secret tip to making this recipe extra AHmazing: use Toasted Coconut Cashews. They make this dish a little sweeter, give it more texture, and just really make it awesome. You can find these at Costco! Spread a few dollops of the yogurt sauce on your favorite tortilla, add a few pieces of Mahi Mahi, andtop with the slaw mixture! This recipe is perfect for the upcoming warm weather. It is light, tropical, and refreshing. These recipes are WORTH TRYING. Trust me, I wouldn’t post them if they weren’t. If you try any (or all) of them, please let me know how it went and what you thought!